2017 APA Planning Awards – Nominations Due! We need your help in identifying and nominating outstanding planning projects, activities, and individuals in the Los Angeles region for the 2017 APA Awards. This is your opportunity to gain recognition for the efforts of your Department, Firm, or City in contributing to the field of planning. 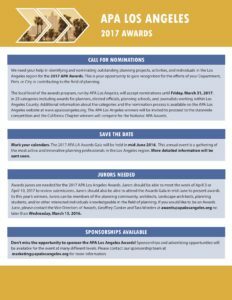 The local level of the awards program, run by APA Los Angeles, will accept nominations until Friday, March 31, 2017, in 23 categories including awards for planners, elected officials, planning schools, and journalists working within Los Angeles County. The APA Los Angeles winners will be invited to proceed to the statewide competition and the California Chapter winners will compete for the National APA Awards. Follow the link for additional information and to download an application packet.